DLTtape Technology provides a family of proven, highly reliable, and cost-effective tape storage solutions to help information-intensive enterprises protect their business-critical data. 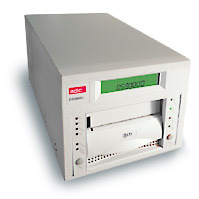 Based on the most successful tape drive platform ever built, 9to5 computer DLTtape product lines provide scalable performance and backward-read compatibility to protect your investment in existing DLTtape media as your business grows. Quantum DLT VS160 LVD SCSI Ext Drive 68 pin cableclean and data cart.